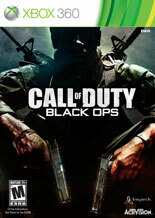 Black Ops is the newest edition to the Call of Duty franchise. The previous installment Modern Warfare 2, was made by Infinity Ward, and was clearly the iconic FPS to which all others were compared…until now. Treyarch clearly brings the best FPS to date in Black Ops, and does it in a time period that Call of Duty has yet to explore, the Cold War. The game begins with the Bay of Pigs and a covert operation to try and kill Fidel Castro, which quickly spins out of control. The Soviets are in league with Cuba, and have recruited former Third Reich scientists to help bring down the United States. The player gets to play as several key characters as a story to espionage, war, and double agents unfold. With the threat of nuclear and chemical warfare upon the world, it is left to a secret group of soldiers called the SOG to bring balance back to the world. In addition to the single player campaign, there are multiple online matches to play. Zombie mode also returns in which you and a friend can fight off hordes of Zombies. Zombies, of course, were not a part of the Cold War, but this was a bonus mode that became very popular in the game Call of Duty World at War and returns here in Black Ops. Despite taking place in the 60’s this game has a variety of weapons to use, and will please any FPS fan. From shotguns, sniper rifles, crossbows, and flame throwers, it also makes melee fighting prevalent and necessary. One other thing to mention is that the tempo of this game is intense. Right at the start of the game you are thrown into the action where you either kill or get killed. Even the cutscenes are intense, flashing brief yet horrific images of war. There is a lot of it. It is war after all. When you shoot someone blood splatters, and when you cut someone blood oozes. You have to fight, shoot, and blow up your way through bad guys to progress through each level. In one scene in particular, you are swimming under a boat in Vietnam when just clicking the right control stick has your character jump from out of the water to grab the Viet-Cong commando, drag him under water where you slit his throat. In another scene, broken glass is put into the mouth of a man who is then repeatedly punched causing blood to spill from his mouth. Blood oozes out into the water while you watch a person whose head is about to fall off of his body because the cut was so deep. When you shoot someone in the head, it can come clean off. Same goes for body limbs… In fact, if you shoot off someone’s arm they will react to it and almost immediately pass out from the pain and blood loss. While the game is very violent, there is an option to tone down (not eliminate) the blood and gore. There is a lot of swearing including the use of God’s name being used in vain. It is a part of the main dialogue and the background chatter. F**k and S**t are heard frequently throughout the game. As with violence, however, there is an option to tone down (not eliminate) the bad language. There is very little sexual content to be mentioned. There are guys running around with their shirts off fairly often, and there is a scene close to the beginning of the game when you go to assassinate Fidel Castro; he is in a bedroom and he uses a woman in a nighty as a human shield…She dies. I am not a fan of first person shooters. I do not like the vantage point, and I do not like the monotony of it all. CoD Black Ops, however, does an amazing job of mixing it up. The different weapons and objectives broke up the FPS boring-ness for me quite well. I REALLY enjoyed playing this game, and might continue playing it. I can easily say it is the best first person shooter to date. There are so many game play options and modes that they will keep you busy for a long time. Also, while it is not a perfect system, the ability to tone down the blood and language of this game is something parents will really appreciate. Still, even toned down, the game is very violent and parents will want to take that into consideration when deciding if Black Ops is a good fit for their family or not.